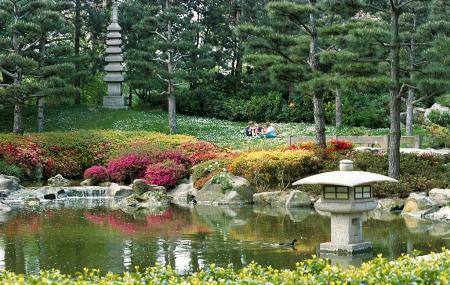 The influence of Japanese horticulture principles is evident in Bonn’s garden designs. The Japanischer Garten is harmonized beautifully inside The Rheinaue overlooking the banks of Rhine. Japanischer Garten was conceived in 1979 by Dr. Akira Sato, with the creation of an Oriental-styled garden as a token of appreciation for Bonn’s contribution to the Federal Horticultural Show ’79. The garden is designed to bring Zen-like calm into the bustling city. It has series of miniature Bonsai plants. You can languish along the Auensee Lake or take a stroll across the two waterfalls. The star attraction of the Japanese garden is the 13-level Buddhist pagodawhich has become the emblem of Bonn’s spiritual centre. It is locally identified on the tour guide programs as Rheinaue Leisure Park- Japanese Garden. The garden is wet in the morning. Watch your steps. The park organizes the iconic “Rhein in Flammen" firework annual event on the first Saturday of May. The park hosts Annual Beer Fest and Hot Air Balloon Show during summers. A mega flea market and fair is organized every third Saturday of the month between April and October. Plucking flowers or taking samples is strictly prohibited. Don’t eat or spill drinks into the carpet lawns. How popular is Japanischer Garten? People normally club together Freizeitpark Rheinaue and Beethoven Statue while planning their visit to Japanischer Garten. People also prefer to end their day with Japanischer Garten.